As he's aged, Michael Douglas has grown less and less sleazy. This is a disappointing fact of life for anyone who associates Douglas with films like "Basic Instinct," "Disclosure," or "Wall Street." Which isn't to say that his recent performances aren't satisfying. Douglas is amply charming in challenging roles like Liberace in "Behind the Candelabra" and Ben Kamen in "Solitary Man." But watching Douglas behave like a narcissistic scumbag is an absolute pleasure, one in which viewers of action-adventure "Beyond the Reach" can happily indulge. Douglas plays Madec, a deranged poacher who winds up hunting Ben (Jeremy Irvine), a skillful human tracker, across the Mojave Desert. With a high-powered rifle in his pleathery hand and a pair of orange-lens aviator sunglasses around his craggy face, Douglas is in his element. He doesn't have to try too hard to be menacing: he just is, as you can see when he nails a hysterically overblown line like "Fool me once? Shame on you. Fool me twice? I kill you!" "Beyond the Reach," a chase movie that loses momentum about two-thirds of the way through, runs far on Douglas's fumes. The secret to Douglas's indomitable charisma is that, while he's always on the verge of blowing it, he almost never loses his behind-gritted-teeth cool. At the beginning of the film, Madec is a prideful blowhard. He's from Los Angeles, and is therefore clueless and very rich. He's also a natural genetic foil for Ben, a young working-class hero with principles and bills to pay. Ben initially tamps down his skepticism when Madec tries to bribe and bluster his way through the private hunting trip he (handsomely) pays Ben to take him on. But something inevitably goes wrong, and Madec turns on Ben, leaving Ben to avoid bullets, the sweltering sun, and other harsh natural elements. I call bullets a natural element since "Beyond the Reach" never once strays from its generic narrative or characterizations. Which is fine, since director Jean-Baptiste Léonetti ("Carré Blanc") and screenwriter Stephen Susco, the latter of whom based his screenplay on Robb White's novel "Deathwatch," do a fine job with the type of story they chose to tell. Léonetti and Susco know that they're in the realm of airport-friendly pulp, and deliver on that level. The film's plot moves along smoothly, and doesn't dwell too much on Ben's backstory (he misses his girlfriend and can't afford college! ), or Madec's background as a cut-throat businessman (he's selling out to a bunch of Chinese businessmen!). 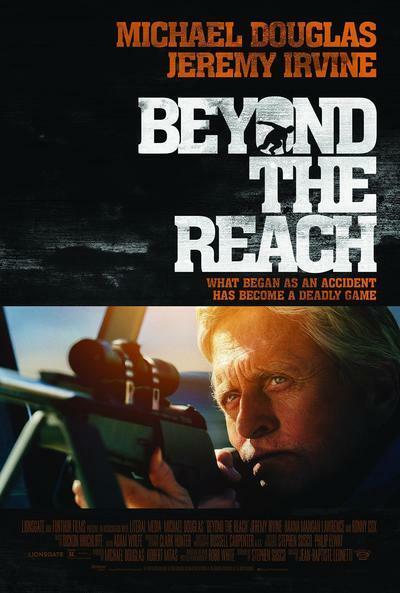 Instead, "Beyond the Reach" myopically focuses on Madec's hunt, a strategy that works until Ben is forced to confront Madec directly, and the film consequently loses its momentum. At that point, it becomes clear just how much Douglas has been carrying the film. Léonetti and Susco wisely tamp down the most inherently flamboyant aspects of Douglas's character. Madec is, after all, a guy that drives a tank-sized jeep, complete with portable martini bar, industrial-grade flood-lights, and a lounge chair that comes equipped with a handset-controlled loud-speaker. He's desperate enough to be absurd, but not absurd enough to be the source of belly laughs. So when he tries to make Ben laugh by making an out-of-the-blue allusion to "Wall-E," you can hear the desperation in Douglas's voice as Madec repeats his weak Wall-E imitation until Ben relents, and laughs just to get the older man off his back. Douglas's performance is such a perfect fit for his simultaneously flinty and silly material. He impatiently squints and sighs his way through the film's corniest dialogue, like when Madec puffs out his chest and boasts about his achievements: "I'm no amateur, kid, and I've got the horns to prove it: elephant, rhino..." That kind of smarmy double entendre is a Michael Douglas special, delivered with consummate ease and without any unnecessary mugging. The best part of Douglas's performance is that it's not even the focus of "Beyond the Reach." Madec essentially controls the film's narrative, so Douglas is realistically inescapable. But the rest of the film is slight but serviceable. Scenes where a surprisingly adequate--and never-not shirtless--Irvine silently navigates the desert are mostly compelling, though Léonetti doesn't really know how to film Madec's car when it's on the move, and the film's cross-cutting-heavy chase scenes are distractingly over-edited. Then again, any scene without Madec is inherently less exciting. If you watch "Beyond the Reach" hoping for some cheap thrills and a juicy Michael Douglas performance, you won't be disappointed.